For many Americans, the Super Bowl is more about chips, guac, and beer than football. And that extends to the broadcast too, where beer commercials have long been an integral part of the telecast. In fact, looking through the history of them over the past half-century can almost help us understand the tenor of the country at any given moment in time. You have to remember, though, that for the most part, Super Bowl commercials weren’t a big deal for the game’s first two decades. That all changed with Ridley Scott’s famed “1984” ad for Apple. Suddenly, the need to roll out a special commercial became paramount. The beer industry quickly took to the challenge. In fact, according to Super Bowl Ad Meter, a post-game survey run by USA Today, a beer commercial has been named the “best” commercial in fourteen of the twenty-seven years it has been tracked. Of course, all those beers commercials were for brands owned by one company, Anheuser-Busch (then ABI), who became the Super Bowl’s exclusive beer sponsor in 1988. Even so, and even if you aren’t a huge Bud fan, you have to admit many of the following spots – which include quite a few other brands pre-1988 (and two sly beer brands post-) – have played an indelible part in American popular culture. Maybe another beer commercial will capture the imagination this year. It’s more likely than the game actually being a good one. If there was a beer commercial during Super Bowl I, no one can prove it, as the NFL does not have a full broadcast of the game on tape. Simulcast on both CBS and NBC, we do know that a commercial spot cost a mere $42,000. The oldest Super Bowl beer commercials that https://www.superbowl-commercials.org has on file, are both, oddly, centered around skiing. Go figure. Neither are particularly interesting or entertaining. This is not a beer commercial, but the legendary Citizen Kane helmer appeared in an awesome wine spot during Super Bowl XIV, back when the game had wine commercials. Miller Lite was able to find someone more famous than those nobody ex-QBs to promote their low-cal product for Super Bowl XVIII. And, why not? It was by then the top-selling light beer in the U.S. While Madden was a much-beloved, former Super Bowl-winning coach who was now famed for his distinctive (“Boom! Where’d that truck come from? !”) announcing style. Most millenials think Madden just designed a video game. The next year, Bud Light tried to steal Miller Lite’s low-cal title, but the king wouldn’t go down without a fight. For Super Bowl XIX, Miller Lite employed Rodney Dangerfield to get “Respect,” while Bud Light urged viewers to not ask, “Give Me a Light,” mocking Miller’s ubiquity. This is probably hard for some of you to believe, but at one time a fictional beer-drinking, skateboarding bull terrier hawking Bud Light was one of the more famous people in America. First appearing in a spot during Super Bowl XXI, the “original party animal” was such a sensation his mug was soon appearing on countless t-shirts, stuffed animals, and all sorts of other crap (a lot of which you can still find on ebay). Of course, most of it was owned by underage children and, thus, Spuds was not without controversy, mainly from MADD and crusty Senator Strom Thurmond. This berry wine cooler isn’t really a beer... but remember those old guys? They were a huge! Taking place over a series of clever spots during Super Bowl XXIII, was a game pitting Budweiser against Bud Light. Let me tell you, as a young boy coming of age at the time, there were few things better than watching stop motion-animated beer bottles playing football with each other. Not to mention, Bob Costas was the game’s announcer! Chris Berman handled studio duties for this one, and Bud Light got its first ever victory on a parody of the famous Stanford/Cal “The Play.” Bud Bowl was losing steam by this point and despite the lack of interest, the company continued with Super Bowl spots over the next four years. After skipping the 1996 game, the Bud Bowl returned for one final grudge match, Bud Bowl 8, during Super Bowl XXXI. No one cared whatsoever by this point. In 2008 Bud Bowl would return once more for pregame festivities hosted by Snoop Dogg. 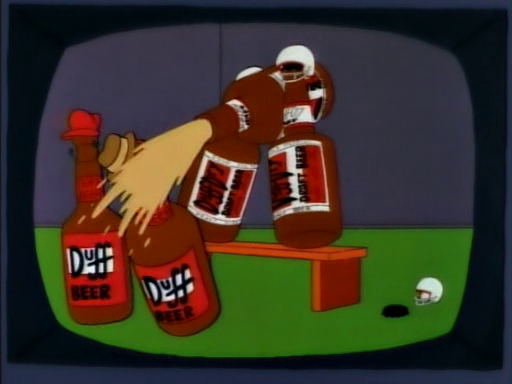 It was also spoofed by The Simpsons as the Duff Bowl. The biggest beer commercial hit since the initial Bud Bowls, like Spuds MacKenzie, a trio of highly-quotable frogs (“Bud! Weis! Er!”) spawned a series of spin-off merchandise and sequalization. The frogs would appear in every Super Bowl but one through the 1999 game. It’s been reported that “all the animatronics, robotics, and hydraulics that would be required to bring the amphibians to life” costs $2.3 million. It too would eventually get spoofed by The Simpsons. Before Borat and Chappelle’s Show, our nation mostly found its overused and annoying catchphrases from beer commercials. That happened again during the new millennium’s first Super Bowl which unveiled a group of buddies (inexplicably watching the big game apart) who liked to answer the phone like idiots. Whaaaaaasssssssuuuuup. An alien-based sequel to the spot unfortunately returned during the 2001 game. The first Super Bowl since the terrorist attacks was no time for Spuds, frogs, or whassup-ing. Instead, Budweiser opted for a more solemn spot – tricky to pull off without appearing tacky. Utilizing the Clydesdales in a respectful way, and with help and advice from then-New York City mayor Rudy Giuliani, Budweiser was one of only two brands to acknowledge 9/11 during the game (the other was Monster.com). The commercial would only air that one time. When USA Today held an all-time Super Bowl ad tournament in 2014, this XLII spot, which spoofs Rocky in a completely hackneyed fashion, won the entire bracket. Well, there’s no accounting for taste. Miller High Life figured out a way to overcome Anheuser-Busch’s grip on Super Bowl ads during the XLIII game. Since AB technically only had rights from kickoff to final whistle, Miller was able to buy a spot during the pregame. Even better, they made it a mere one second commercial—playfully critiquing the fact that their rival was spending a whopping $3 million per 30 seconds during the game. The salvo worked, and High Life sales leaped nearly 9%. Beer geeks got their cargo shorts in a tizzy when Bud had the gall to mock them during Super Bowl XLIX. Let me tell ya’, it was remarkable how many beer blogs wrote slapdash think pieces in the ensuing twenty-four hours. Nevertheless, if the commercial mocked craft beer for being “brewed to be fussed over” and lampooned the (theoretical) idea of some pumpkin peach ale, craft beer fans couldn’t help but noting that Anheuser Busch InBev had recently acquired Elysian – who just so happened to actually make a pumpkin peach ale. At Super Bowl LI, Spuds MacKenzie (as a tough-talking ghost) made his triumphant return in an homage to Dickens’ A Christmas Carol. The original Spuds was surely spinning in his grave at the lame spot. Even seemingly anodyne things began stoking controversy in the Trump era. Such was the case for Budweiser’s Super Bowl LI spot, run just a few months after the election, which purported to show Anheuser-Busch founder Adolphus Busch’s hardscrabble emigration to the U.S. from Germany. Unfortunately, this ad was run just in the wake of Trump’s executive order barring peoples from Muslim countries from coming here. Though InBev claimed this was a pure coincidence, pro-Trump supports were angered by the spot, and #boycottbudwiser (note the spelling error), was soon trending on Twitter.